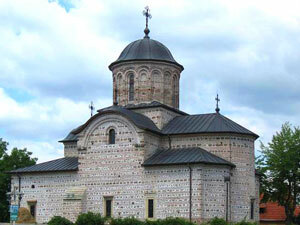 In Curtea de Arges we have two important stops to make. The first one is the Royal Church finished in 1365 during the time of VladislavVlaicu, and the second one is the necropolis of the kings of Romania of the Hohenzollern - Sigmaringen dynasty, at The Arges Monastery. The building started in the time of Basarab I (1310-1352) in 1340, exactly 10 years after the great victory of Basarab over the Hungarian King - Carol Robert of Anjou. Except for the stone cellars of the formerly Royal Court, only the Church dedicated to St. Nicholas is preserved. 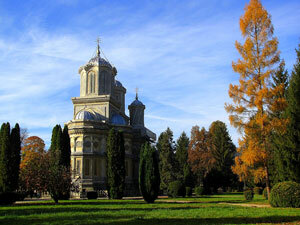 The spectacular structure was accomplished during the reign of three voivodes and eventually served as a royal burial ground. Here were no doubt buried Radu I and his brother VladislavVlaicu, as well as other members of the ruling family. The fashion in which the edifice was erected is a purely Byzantine one. This is clearly visible not only with the building’s plan but also from the entire architectural design. Although in time the construction did suffer some changes, not necessarily for the better, nowadays it is revealed to us in its entire original beauty. Even today the austere design, entirely brickwork and displaying only a single spire and a two-aisled naves, makes a strong impression. The paintings in the edifice were preserved and they represent the oldest most complete ones in the south region south of mountains. The work on the frescoes was carried out in the time of VladislavVlaicuVoivod and the execution was one of great quality. The painters managed to include in their characters a certain naturalism, which again impresses the careful beholder. Both Basarab, the first important voivod of The Romanian Country and his father Thocomerius had Turkish sounding names, possibly of Cumanic origin. This testifies to the initial extraction of the Romanian dynasty out of the Cumanic nobility who were in an advanced process of becoming Romanian and living on both sides of the Carpathians. Under the window from the southern side you can see unique frescoes of Virgin Mary pregnant. Basarab’s most significant accomplishment was of course, the victorious battle between 9-12 of November 1330, that took place along a narrow pass in the Carpathians, against the Hungarian king Carol Robert of Anjou. On the northern wall of Curtea de ArgesChurch,time has preserved a little inscription scratched in old Slavonic by one of the masons: „in the year 6860 (1352)* in Campulung, passed away the great VoivodBasarab“. Like his son, Nicolae Alexandru, Basarab was not buried in his foundation Curtea de Arges, because it was not yet completed. It seems that the first voivod buried in St Nicholas Royal Church at the same time that the edifice got painted, was VladislavVlaicu. The richest grave there which was discovered during archaeological diggings led by V. Draghiceanu, after the Great War (1922), was attributed to him. The investigations revealed the purple princely garments, which deteriorated rapidly on contact with the fresh air, but the golden buttons, the pompous buckle, the rings and a diadem, all from the same metal, remains a testimony of the grandeur of the royal attire. On the other side of the Basarab Boulevard from Curtea de Arges, you will find The Monastery of Curtea de Arges, as it is known in Romania. There, you can see a church built originally in 1512 and then repaired and renovated around 1900 by the King Carol I of Romania. The oriental influence on the architecture, created by two frontal twisted towers and by all the decorations around the church, is obvious. Also under the roof you can see small metal made birds which have a small bell in their beaks, bells which ring when the wind is strong enough. Inside the church you will find on the right hand side the graves of Carol I and his wife Ecaterina, first King and Queen of Romania, from the Hohenzollern - Sigmaringen dynasty, and on the left hand side the graves of King Ferdinand I - The Faithful (to Romania) and his wife, Queen Mary. Above the door on the left is painted the image of the King who made the plans for the church and also renovated it and on the right his wife with a big Gospel in her hands. It is a gospel made by her with golden wires, which can be seen in a shop window at the feet of her tombstone. Near it, on the left, is the grave of NeagoeBasarab the ruler, which was made in 1514. Now he has become a saint in our church and that is why you will see his icons right there. If you look carefully around you will see the 12 pillars sustaining the roof, the same number of the apostles.